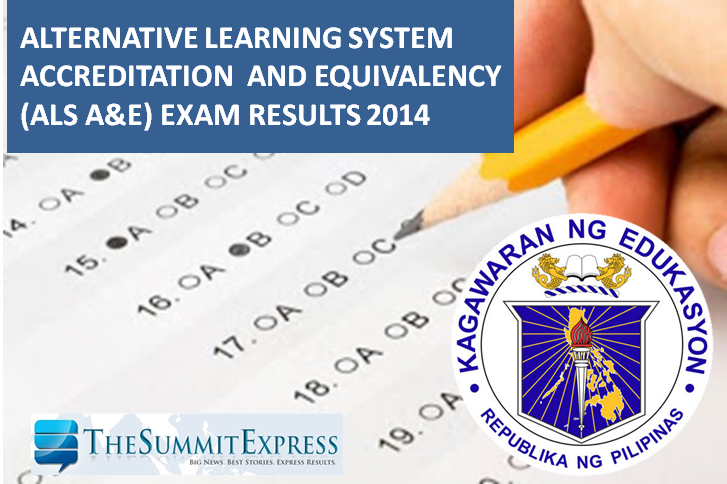 MANILA, Philippines - The Department of Education (DepEd) officially released on Tuesday, May 26, 2015 the results of 2014-2015 Alternative Learning System Accreditation and Equivalency exam (ALS - A&E). The alphabetical lists of passers for elementary and secondary are now posted online. ALS A&E was administered in 17 regions nationwide by the Bureau of Alternative Learning System (BALS) of DepEd on December 07, 2014 (Regions 1, 2, 3 and CAR), December 14, 2014 (Regions 4-A, 4-B and 5), January 11, 2015 (Regions 6,7 and 8), January 18, 2015 (Regions 9, 10, 11, 12, Caraga and ARMM) and January 25, 2015 (Metro Manila).